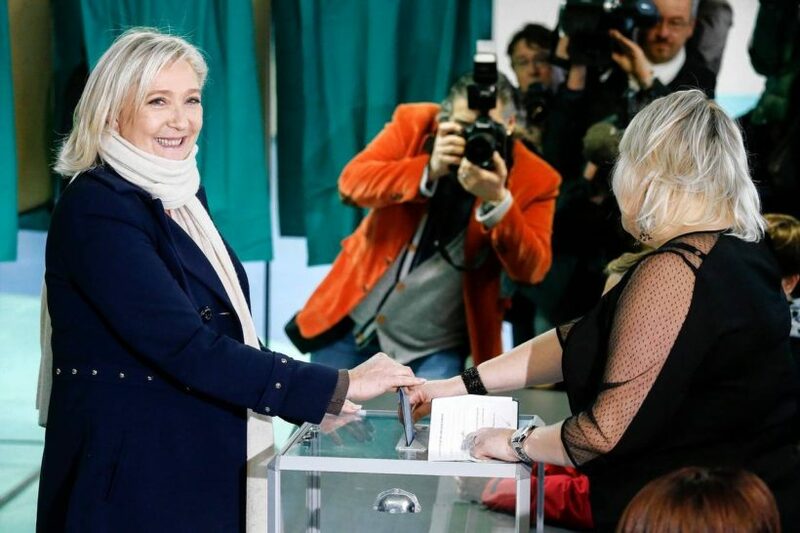 National Front leader Marine LePen casts her ballot. 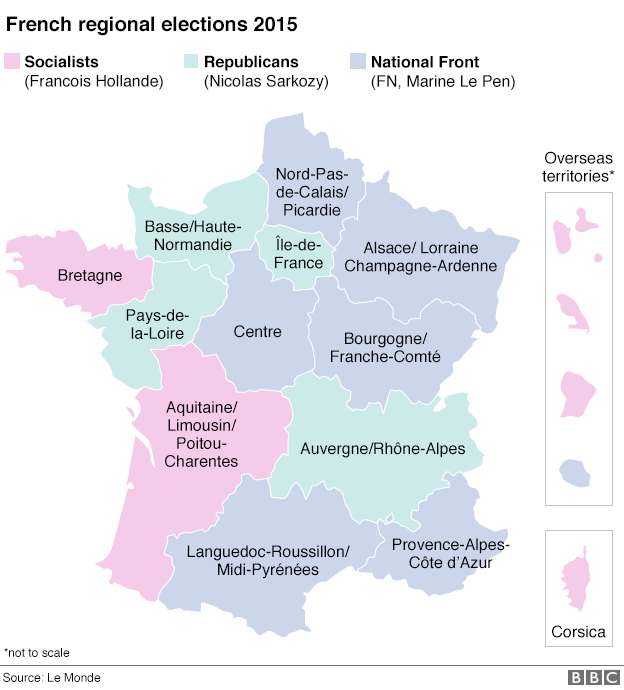 The anti-European Union and anti-immigration FN [National Front party] scored just over 28% of the ballot, claiming a lead in six of 13 regions in mainland France. The party was ahead of the conservative mainstream led by former president Nicolas Sarkozy (27%) and the ruling Socialists (23.5%). No one party scored the 50% needed to secure outright victory in the first round. The second round will take place this coming Sunday. The French electoral system has always tended to keep the far right from power, with voters rallying against the National Front in second rounds. But the prognosis (prediction) for next Sunday’s second round is less clear. The FN’s repeated linking of immigration with terrorism has also helped it climb in the polls since the gun and suicide bombing assaults in Paris on November 13. Mr. Maduro, 53, quickly acknowledged the defeat, the worst for the ruling “Chavismo” movement since its founder Hugo Chavez took power in 1999. “We are here, with morals and ethics, to recognize these adverse results,” Mr. Maduro said in a speech to the nation, although he blamed his defeat on a campaign by business leaders and other opponents to sabotage the economy. “The economic war has triumphed today,” Mr. Maduro said. His quick acceptance of the results eased tensions in the volatile nation where the last presidential election in 2013, narrowly won by Mr. Maduro, was bitterly disputed and anti-government protests last year led to 43 deaths. Opposition leaders, who have lost over-and-over since Chavez’s first election victory 17 years ago, were jubilant, even though (according to this reporter) their victory was mainly thanks to public disgust at Venezuela’s deep economic recession. Opposition sources predicted that once counting was finalized, they would win as many as 113 seats. That would give them a crucial two-thirds majority needed to shake up institutions such as the courts or election board. The result could also embolden government opponents to seek a recall election against Mr. Maduro in 2016 if they can gather the nearly four million signatures needed to initiate the referendum. Critics say failed socialist policies, including nationalizations, rigid currency controls, and hostility towards the private sector spurred the economic crisis and that it was then exacerbated by a global slump in oil prices. Venezuela depends on crude for 96 per cent of its export revenue. The government’s defeat was another blow to Latin America’s left following last month’s swing to the center-right in Argentina’s presidential election. South America’s bloc of left-wing governments, dominant for over a decade, has lost some of its clout this year. Venezuela’s opposition [opposed to the socialist governement] will now have the chance to break the ruling party’s control over the budget and seek amnesty for dozens of jailed activists, including political prisoner and former Venezuelan politician Leopoldo Lopez. Mauricio Macri, who on Thursday will be sworn in as the new president of Argentina, is engaged in a public dispute with Cristina Kirchner – who he accuses of sabotaging his new government. “It seems the idea is to fill the transition process with obstacles and create as many problems as possible for the new government,” said Mr. Macri, whose election on November 22 marked a failure for Mrs. Kirchner to install her chosen socialist successor, Daniel Scioli. Mr. Macri, mayor of Buenos Aires and former president of Boca Juniors football [soccer] club, complains that Mrs. Kirchner is obstructing access to public accounts and hampering a smooth transition. “This is a sad choice that the president has made. Everything she does that she thinks will hurt our government will in reality hurt all Argentines,” he added. 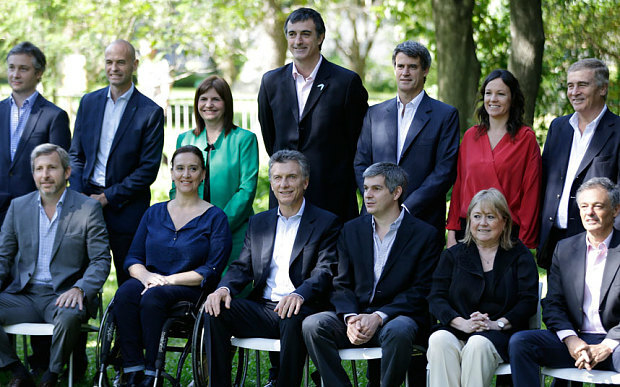 Kirchner has approved the delegation of billions of dollars of spending to provincial governors. With ten days to go until the December 10 handover, she changed the budget for the next year, with increased spending on Congress, the judiciary, the security forces and her prized social plans including Football For All – a program which shows free football matches, alongside political messages. She has appointed a slew of new ambassadors – to Cuba, Australia and the UAE – which, as political appointees, can be replaced by Mr. Macri, but present a headache. Alejandro Vanoli, the combative president of the central bank, was expected to resign – as many of Mrs. Kirchner’s appointees have done – but is clinging on. And even the handover ceremony has been contentious, with Mrs. Kirchner planning on holding a final “farewell” rally on Wednesday night, followed by a handover in Congress on Thursday. Mr. Macri wants the handover to be at the Casa Rosada presidential palace. c) Why will a second round of voting take place on Sunday? b) Why is the victory of the opposition Democratic Unity party so significant? c) The Venezuelan people supported the socialist government’s economic policies, believing they would have a better life under them. What have voters since discovered about the reality of implementing socialist economic policies? 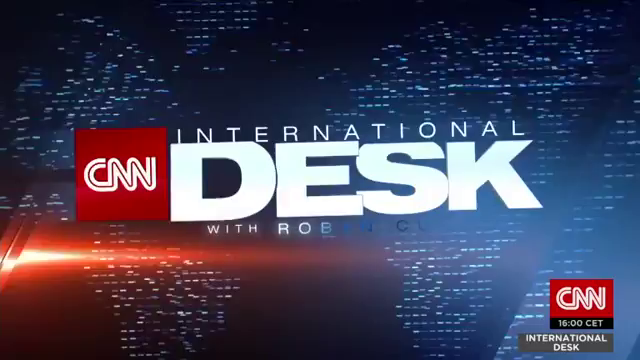 CHALLENGE: Watch the news report under “Resources” below. What major changes/steps could the assembly, controlled by the Democratic Unity coalition take? b) What has newly elected president Mauricio Macri accused out-going socialist president Cristina Kirchner of doing? c) What specifically has President Kirchner done with government spending and with government appointees? d) What one or two words best describe President Kirchner’s decision to take these actions? CHALLENGE: Which out-going U.S. president’s administration caused “damage, theft, vandalism and pranks in the White House complex” in the presidential transition, as confirmed by an investigation of the General Accounting Office (GAO), an investigative arm of Congress? Underlining the depth of feeling, videos circulating online seemed to show five prominent socialist politicians – including Chavez’s brother Adan – being booed at voting centres on Sunday, with crowds yelling “the government will fall!” or “thief!”. “I voted because we want a change in this country. We’re bored of so many queues, food shortages, a minimum wage that doesn’t get us anywhere,” said Cristobal Jesus Medina Chacon, a 27-year-old engineer who arrived at his voting station in the western city of San Cristobal at 4am. Sunday’s parliamentary election is the first major defeat of the socialist party in Venezuela in 17 years, and since it represented a turnout of almost 74% of the eligible population, can be said to be unquestionably representative. The Socialist Party has already instructed its candidates in three regions to pull out of the run-off contest in a bid to bar the FN (National Front party) from power. But Nicolas Sarkozy, who leads the conservative Les Républicains, has refused to give similar instructions in regions where the Socialists have a better chance of beating the far right [by letting the conservatives win because they know they cannot win]. “Nothing would be worse for the right to be seen to be cosying up with the Socialists in a ‘Republican soup’,” the right-leaning Figaro newspaper said on Monday. Other newspapers, however, expressed the need for voters to support candidates they would otherwise abhor in order to keep Marine Le Pen’s party from the gates of power.